When I started working on Denied By Reign, I intended it to have two primary purpose. Firstly, I wanted it to be a good representation of my own creativity, as any musician would want. With this goal in mind, I have worked to produce a pretty thumping metal album, and I am really proud of it – I hope some necks ache out there. 🙂 But the second purpose is more important – to explore what is possible when an independent artist releases their work in the new music economy. Today the next phase of Severed Fifth begins and in this critical time, our focus shifts to exposure. 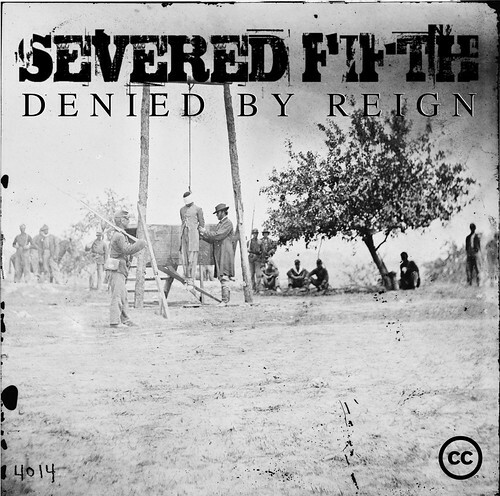 To build success around Severed Fifth, we need to get Denied By Reign in the hands and ears of everyone. The goal here is to spread the word about the album and strongly celebrate its free culture foundation. I am hoping Denied By Reign will be an example of how a free culture album can gain critical exposure and success, and how this can open up other opportunities for artists. With this in mind, we have the Severed Fifth Street Team – a collection of Severed Fifth fans around the world who are going to help with this goal of getting the album oodles of exposure. I have heard of people who are going to print out posters and put them in music shops, burn Denied By Reign to CD and play it in clubs and venues, and one guy even talked about taking a Denied By Reign CD, putting it in a boombox and walking down his town high street. Download Denied By Reign and review it. Put it on your blog, and talk about the project. Will this be available in flac at some point? I have never listened to any kind of music even remotely similar to this, but I have to admit I actually like it quite a bit. 😈 Especially the two first minutes of “Edge of Design” is really nice. Will be possible to buy CD? When do you think it’ll be up on jamendo? Great work! I haven’t had a chance to listen to it yet but I’m looking forward to it. Are you planning on releasing the tracks for remixing? 😮 Cool! Congratulations and good luck! My congratulations and thanks for the release! I’m downloading it right now, and have just noticed that Oggs are transcoded from the MP3s, but hey! This is a double loss of sound! Would you consider reencoding the Oggs from the original media? Thank you! Just listened to the album. There are some vocals I really don’t like (e.g., War), and maybe the overall sound lacks of bass (drums sound a bit weird), but overall it’s quite good I would say. Thanks for doing this! Congrats! Any plans to also upload it on jamendo so more people find it in the future? Jono — How do you plan to link this project to the first step in the process for Everyone Else? That is, how does this model work for an independent musician who doesn’t have a widely read and syndicated blog? Because without that step, proving the model is going to be much more difficult. Is developing this idea an evolutionary process, where that step will be scoped and confronted in a later iteration? Great album, but I have to agree with Athropos, the overall sound really lacks of bass. sorry for being the party pooper and I understand that you need the publicity to get noticed. But I’m kinda stumped to see an actual hanging on Planet Ubuntu, used to advertise entertainment. Ok, so the music’s style requires this kind of images and it requires you to be blunt and “brutal”, whatever being brutal means. If it means using the photograph of a killing to advertise music, it may be part of what your target audience likes, but hey, I’m not reading Planet Ubuntu for that. So please – can’t you put the Ubuntu-relevant content on the Planet and leave the gory stuff in your own blog? @H: wow, such an unfriendly place Planet Ubuntu is? I wote about the album on my own blog, aggregated on Planet Fedora, and I think I did nothing wrong, as this album is related to Free culture and Free culture goes hand in hand with Free software, complementing each other. Like Martin says above – I’ve not listened to this style before either. That said, I liked the samples in your earlier post, so I’m going to download it now. Congrats on getting it out there. @nicu – I don’t mind that Jono makes some noise for his album and I wish him the best of luck. But – this album was advertised on Planet Ubuntu using the photograph of a man being killed. Yes, I’m a bit touchy about that particular detail. I would like to have a go at a remix, using Ardour 😉 But I would need at least one song track by track, preferably in a lossless format. Currently I’m leaning towards Beating Heart. BTW, are the lyrics up somewhere?